Business is Better Because of You! Here at The Greater Sarasota Chamber, we often catch ourselves pointing out our members when we see them out and about in Sarasota or while we’re driving through town. You’re doing good business in the community and we want you to know that we’ve noticed. 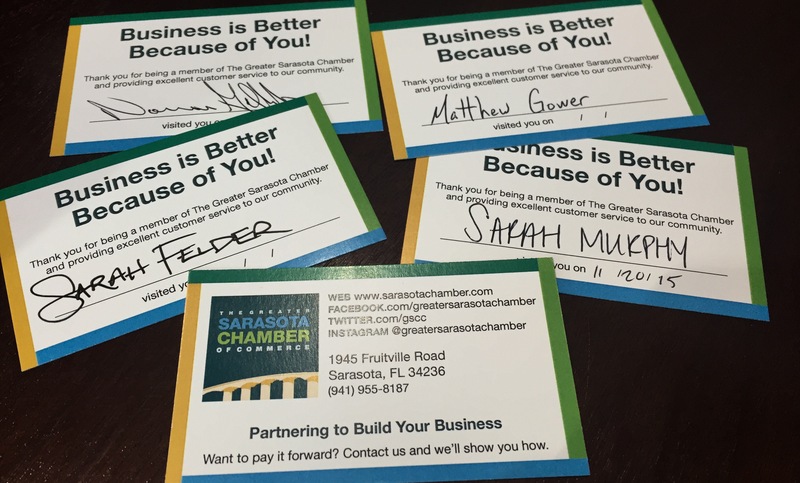 That’s why we created “Business is Better Because of You” cards to thank you for being a member of The Greater Sarasota Chamber and providing great service to our community. Staff, volunteers and fellow Chamber members are encouraged to leave behind one of these cards after they visit or receive a service from a member. Leave one with your server at a restaurant, offer one to a new contact when you give them your business card or drop one off at the front desk where you finished an off-site meeting. The possibilities are endless. Want to pay it forward? Stop by The Chamber office or pick up some cards at the next Chamber event. You can find Chamber members by using our online directory or finding a business with a Chamber decal displayed on their window. When you’ve received great service from this member, leave them a card to thank them! If you find a “Business is Better Because of You” card at your business, share it with us! Post your card on social media or contact us to learn how to get involved. Has your business already received one of these cards? We’d love to hear about it in the comments below. Business is better in our community because of Chamber members like you. Thank you for promoting good business in Sarasota. Previous Post Meet Our Members – Kerkering, Barberio & Co.